The evidence-based practice movement has become an important feature of health care systems and health care policy. Within this context, the APA 2005 Presidential Task Force on Evidence-Based Practice defines and discusses evidence-based practice in psychology (EBPP). In an integration of science and practice, the Task Force’s report describes psychology’s fundamental commitment to sophisticated EBPP and takes into account the full range of evidence psychologists and policymakers must consider. Research, clinical expertise, and patient characteristics are all supported as relevant to good outcomes. EBPP promotes effective psychological practice and enhances public health by applying empirically supported principles of psychological assessment, case formulation, therapeutic relationship, and intervention. The report provides a rationale for and expanded discussion of the EBPP policy statement that was developed by the Task Force and adopted as association policy by the APA Council of Representatives in August 2005. 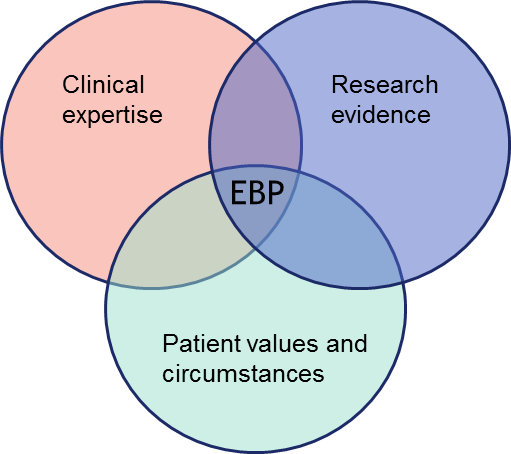 Kort samengevat: Evidence-based practice in psychology (EBPP) is the integration of the best available research with clinical expertise in the context of patient characteristics, culture, and preferences (see picture).